This pure, well-rounded black tea will become a constant in your tea cabinet. The subtly sweet aroma precedes the beautiful dried leaves. The long, slim leaf is twisted and varied in warm colors from medium amber to dark brown. Golden buds are interspersed. The infusion is soft, with mellow notes of semi-sweet chocolate, leather and caramel. Absolutely no bitterness. The soft mouthfeel imparts a very pleasant, satisfying aftertaste. 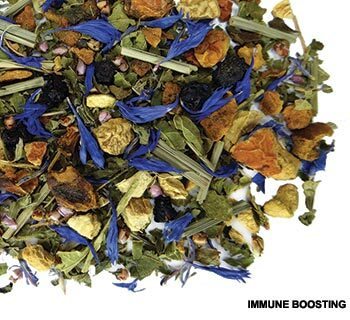 This complex flavor profile is a real treat for black tea enthusiasts and can be enjoyed in multiple infusions. The Fujian Province on the southeastern Chinese coast is a tropical and mountainous coastal climate, perfect for growing exceptional tea. Abundant rainfall and mild temperatures in this almost completely forested area create highly fertile soil, and thus amazing tea. 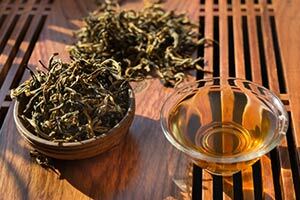 Grown here, Golden Monkey is harvested in the spring by carefully picking one leaf and one bud. Then the leaves are withered, rolled and dried. Enjoy this traditional black tea any time of the day. Team it up with your favorite baked good or a creamy caramel. Sip it with a snack of spiced cookies or candied nuts. This tea gets its fun name from the way the leaves look like monkey paws!